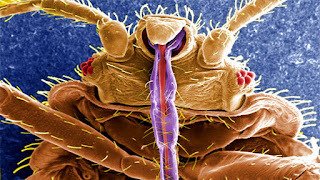 MedFriendly Medical Blog: Don't Let the Bedbugs Bite! Don’t let the bedbugs bite. What used to be a funny phrase uttered to children before tucking them into bed has now become a serious concern for people sleeping in hotels, college dorms, hospitals, shelters, and in their own homes. This pandemic has made many consider staying home from a vacation or enrolling in online classes for college. But what are bedbugs anyway, what do the bites look like, and what can you do to get rid of them? Below is a pictoral guide that gives you some of these answers. First, here is a picture of a bedbug (also known as Cimex lectularius) under the microscope. The purple looking structure is a needle-sharp body part known as a proboscis, which is inserteded into the host’s skin (human or animal) and allows it to feed on blood for about three to five minute. 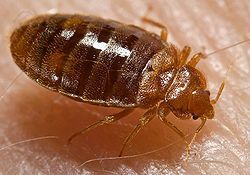 The bedbug injects saliva into the wound that contains anesthetic (pain reliever) to prevent the host from awakening and anticoagulant to keep the blood from clotting. Bedbugs are attracted to carbon dioxide and body heat so they like to be where people are. 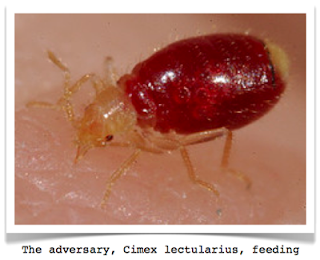 They are called bedbugs because they like to hide in mattresses and bedding. They hide in small crevices and can be in luggage, boxes, trash, furniture, and clothes. Humans are dinner sources for them and their favorite time to feed is just before the sun rises. When finished with their meal, they swell up like a tick. Unlike ticks, they then fall off the host, crawl into their hiding place, and digest their meal. They sometimes leave blood stains along the seams of mattresses but can also leave dark droppings behind as well. Although most common in developing countries, they have been present in North America more due to increased international travel. They can live for 10 months and can go weeks without food. 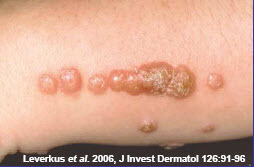 The good news is that bedbugs do not appear to carry or spread human disease. How to get rid of them? Get rid of mattresses and box springs infested with bedbugs. You can also cover the bed with a plastic mattress bag to trap the bugs. Infested clothes and bedding should be washed in hot water and dried on high heat. Any furniture of cracks (e.g., in wood floors or doors) should be cleaned and vacuumed as should suitcases. Calling an exterminator is another option. If you use your own insecticide (e.g., in cracks of floors or bedframes) this should not be applied to areas that result in direct skin contact.